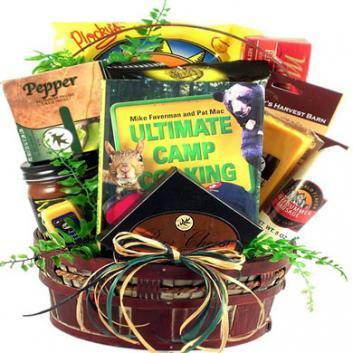 A gift basket is filled with delicious snacks, goodies and gifts for campers, hikers, hunters and those who love the outdoors. This gift basket is filled with a host of delicious snacks, goodies and gifts for campers, hikers, hunters and those who love the outdoors. Perfect camping gift for the camper on your gift list whether enjoyed at home or around the a campfire.